You’ve probably been advised to opt Instagram as your designated platform for utilising influencers. But this doesn’t apply to every marketer. You need to hit up the social platforms which have the influencers that your audience will actually resonate with in a meaningful way (and yes, this could still mean Instagram is right for you, of course). You need to promote your product to the type of people that would naturally be interested in your product, in the places they are most engaged. Depending on your available budget, one platform may actually be more suitable for your brand. However, the best results can be found by taking a multi-platform approach. Why just use Instagram influencers, when you could make a long-lasting effect on that same audience by utilising a variety of social platforms, such as Instagram, YouTube and TikTok. Different parts of your target audience have deeper mental connections with influencers on certain platforms. For example, a consumer that follows Influencer A both on YouTube and Instagram, may be more influenced by Influencer A on YouTube, rather than Instagram. Because of this, it can be wise to adopt a multi-platform approach. Also, the more places that a consumer sees your brand, the more likely that they are going to recognise your brand and build a connection with it. Alike traditional display advertising, it’s more effective to get your brand seen all over, rather than in one location. Multichannel B2C campaigns give a 24% greater return on investment than single-channel campaigns. This presumably assumes that marketers first do their homework to ensure they select influencers operating in the same channels as their brand’s target audience. A staggering 97% of multichannel marketers report an improvement in their company’s revenue. Also, 72% of consumers say they would prefer to connect with brands and businesses through multichannel marketing channels. This should come as no surprise. As we will elaborate further below, most consumers use a variety of social networks, depending on their purpose. A study by Global Web Index found that the average internet user operates seven social media accounts; nine in the case of 16-24 year-olds. Most firms experimenting with influencer marketing focus their efforts on influencers that are active on one particular social network. For instance, some attempt to work with the best Instagram influencers they can find. This can sometimes be effective. We have worked with many firms and helped them create successful single-platform influencer marketing campaigns. Yet, by doing so, you are neglecting potential customers who choose not to engage in that network. If you were to take a multi-platform approach, you are spreading your potential reach. As the saying goes, when targeting one social platform ‘you’re putting all your eggs in one basket’. When you utilise a number of social platforms, you are likely to expose your brand to hundreds, thousands or millions of people multiple times. As a result, they will be more likely to recognise your brand. You will want to look strategically at which channels offer the most potential for your influencer marketing campaign. Each social network has its advantages. One central question you have to ask is, does your target market spend time on that channel actually looking for new products or services? Also, even if they’re not looking, are they going to be more inclined to purchase after seeing your brand there? Currently, YouTube is especially popular with those under 30. A recent survey by ComScore found that Millennials prefer digital video over traditional television, with 35% considering YouTube to be their preferred way of consuming video. That’s double the support of non-Millenials. In addition, YouTube is especially suited to brands in industries such as fashion, beauty, tech, gaming and other entertainment industries. There are thousands of content creators that produce high-quality videos to reach relevant consumers. As we all know, Instagram is a highly visual channel and the most utilised social platform for influencer marketing. It is an excellent place for brand visibility and its popularity has snowballed in recent years. It has 800 million daily users at present, and like YouTube, it is popular with most under 30 year-olds. Beauty, fitness, fashion, luxury, lifestyle, and food are some of the most dominant influencer niches on the platform. 60% of the women surveyed in the Bloglovin’ Consumer Survey considered Instagram to be the leading platform to follow influencers. Alternatively, Facebook attracts people of all ages. 1.45 billion active users visit their Facebook account every day. Its support base has aged in recent years, though. More baby boomers now use the platform regularly. 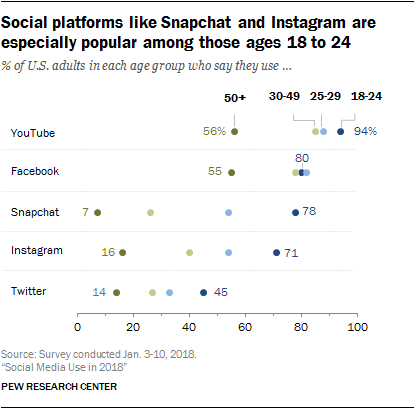 Although most teenagers still operate a Facebook account, many now chat on social networks less popular among their parents. Therefore it is more widely used to promote to an older audience. Nonetheless, there are a lot less prominent influencers on Facebook nowadays and it is not as popular for influencer marketing campaigns as it previously was. You will also find specific channels which appeal to certain types of audiences. Some of the best known are Twitch, where many gamers spend their time and TikTok (the app which merged with musical.ly) which appeals to creative people from all types of niches. Most people do not restrict themselves to just one social network. Even with a relatively specialised niche like gaming, you will find that most gamers spread their social time between YouTube and Twitch, as well as Instagram. Zoe’s niche is beauty, and the above figures show just how widespread her beauty following is. She may have made her name on YouTube, but she has fans spread across a range of channels. She even has 2.5 million people subscribing to her Facebook page. Most influencers, of course, don’t have the massive following Zoe does, but quite a few still spread their influence widely. If you limit your resources to influencers on a single channel, you are ignoring potential customers on other networks. There may well be some overlap between Zoe’s YouTube, Instagram, and Twitter followers, but there will undoubtedly be people who spend time on only one or two of these channels. 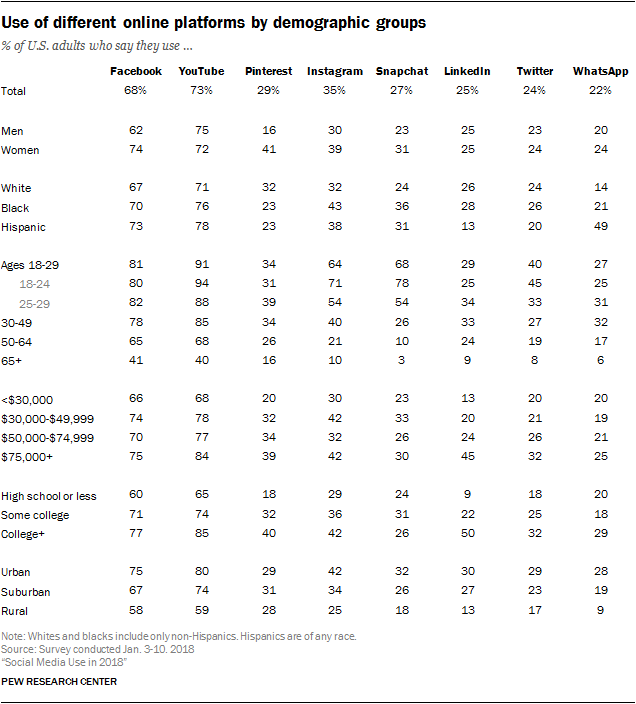 Earlier this year, Pew Research broke social media use down demographically across the various platforms in the USA. These figures are considered to be similar in the UK. As you can see from their statistics, there is considerable variation in social media usage among different social groups. Depending on how you target your product, you may well miss a considerable number of potential customers by limiting your influencer marketing to one channel. In an interview of 347 influencers, one question involved identifying their preferred social networks for sponsored ads. The respondents showed a wide divergence in their views. The most popular channel was Facebook with 32% support, followed with Instagram with 24%, Twitter 18%, Pinterest 10%, and Other 12%. In addition, all of the respondents operated an active blog. A more recent report from Linqia – “The State of Influencer Marketing 2018″ – surveyed 181 marketers. They had a somewhat different view on the comparative social channels. 92% of these marketers viewed Instagram as the most important network for influencer marketing, with Facebook and blogs next in importance. Somewhat shocking seeing as YouTube is still such a powerful channel for targeting consumers. It is clear that the influencers liked to share their content across a range of social channels. Mike Froggatt, Director of Intelligence for subscription research and business intelligence firm L2 believes businesses will better meet their objectives if influencers operate across a range of social platforms. He feels that certain networks gel with each other, for instance, Instagram pairs well with YouTube because they are both visual platforms. Obviously, the speed at which leads become customers will vary across different industries. For instance, it is much easier for a clothing brand to send people through the funnel than it is for an automobile company that sells high-value products. However, regardless of your industry, you will probably need influencers to help create awareness of your brand to move them further down the sales funnel. This is no different with influencer marketing than it is with traditional marketing channels. Television advertisers, for instance, don’t pay to play an ad once and then stop the campaign because they believe their job is done. They will also typically buy a package of advertising on a range of television channels, to reach a broader audience. If a potential customer sees your brand message across two, three or four of their social networks, the message gets cemented into the consumer’s mind, especially when social media influencers are spreading that message. Working with individuals across their multiple channels can be beneficial. Quality influencer marketing agencies can adapt the content of influencers across their networks. YouTube tends to be more expensive than Instagram because of the time, effort and value of those videos, but it might be an excellent route for your brand. By hitting multiple touch points of their audience you can improve their familiarity with your offerings. We wrote last year about the highly successful Deadpool influencer marketing campaign which won the Multi-Platform Campaign at the 2017 9th Shorty Awards. A key to this campaign’s success was that it recognised that Deadpool would be of interest to people using a range of social media sites. Fox Home Entertainment realised this and worked with a range of influencers on Facebook, Twitter and YouTube. This helped them reach as many superhero movie fans as possible. While you can gain immense success from taking a multi-platform approach to influencer marketing, you will still want to ensure that your influencers tell a consistent message. By all means, adapt your strategy to take advantage of specific peculiarities of each platform, however, ensure they clearly know the essential theme of your campaign. Obviously, this is easier when you work with fewer influencer across multiple networks. However, you can still work with a large range of influencers as long as you provide the influencer marketing agency you are working with, with a clear brief and campaign objectives. Ultimately you should leverage the strengths of the influencers you use across a wide range of social networks, especially where your potential customers spend their time and are likely to be influenced.